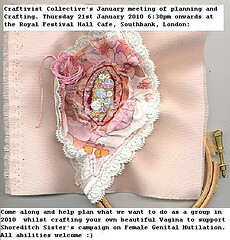 On Thursday 21st January 2010 the Craftivist Collective had their monthly meeting in the London Southbank Royal Festival Hall cafe 6:30pm onwards. This time we joined forces with the beautiful, talented and passionate activists the Shoreditch Sisters (who are a Womens Institute group) to get as many people as possible to create beautiful vaginas to make people aware of the issue of Female Genital Cutting, ‘designer vaginas’ and the stigma and disgust people have for our natural organs. We had about 30 people attend and lots of people really interested in this project who let me know they were upset they couldn’t attend. People sipped fair-trade tea and we had people of all crafty abilities embroidering beautiful vaginas (yep, you heard that right) whilst the Shoreditch Sisters explain how this is helping online pharmacy delivery their campaign on womens rights that are being affected by Female Genital Mutilation. We also discussed plans the Craftivist Collective want to do in 2010 to help make people aware of global poverty and injustices. This project is ongoing for the rest of 2010. We are hoping to make kits to post, give out at events and have at future meetings to people to add their embroidered vaginas to the Shoreditch Sisters collective. Hopefully they will be exhibited in London in February 2011.